It's been nice to settle in to my regular routine over the last few days. Truth be told, I do miss being on Holiday and being around family and friends. But there is something deeply pacifying about being back home doing my thing. I haven't baked in ages. Furthermore, its been about three months since I last shared a baked recipe here. I was tossing between cookies, brownies and tea cakes. And while I was looking, I realized that I had this exotic little gem saved in my massive 'must-try' list. And with a name as exotic sounding as Basbousa, I had to. So as soon as the temperature dipped a tiny bit, I decided to turn the oven on. 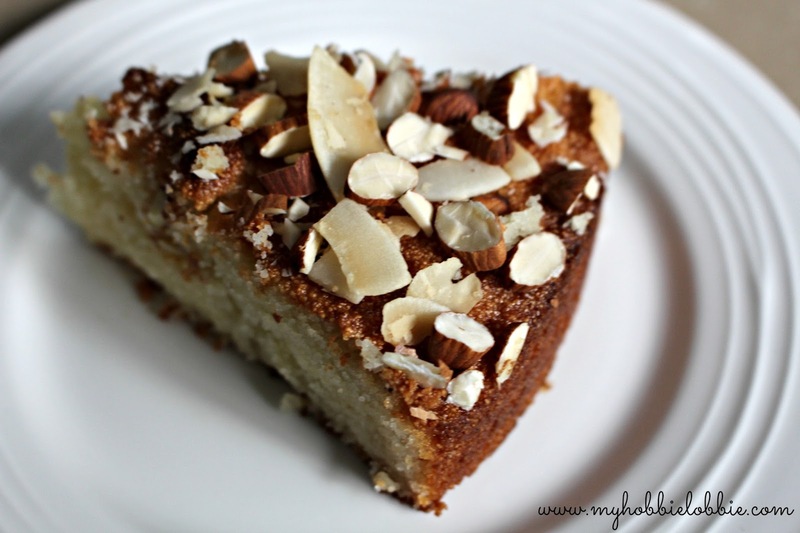 Basbousa is an Egyptian semolina cake drenched in sugar syrup. This batter comes together really quick and easily. 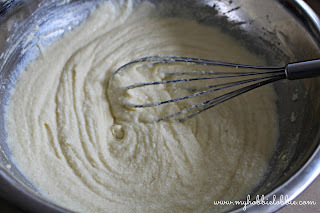 There's no need to break out the heavy equipment, I just used a whisk. So basically you bake the cake, make a sugar syrup and drizzle it over the cake and top with some sliced / slivered (flaked) almonds and coconut chips and that's it. This is a dense tea cake, so don't expect a light sponge. It has a very different flavor profile compared to a basic sponge too. It has a subtle tang from the yogurt and the lemon in the syrup. Dare I say, it is very deliciously different. My husband really liked this cake. And he is someone who loves a good chocolate cake and the occasional sponge cake. This one though, he has asked me to keep track of, so that we can make it again. Imagine my surprise. But then again, it wasn't overly surprising considering how good this cake is. Try it out for yourself. Preheat the oven to 170ºC and grease a 9 inch cake tin and keep aside. Melt the butter and set aside. You can do this in a little saucepan on the stovetop on in a little microwave safe bowl in the microwave. Set this aside. 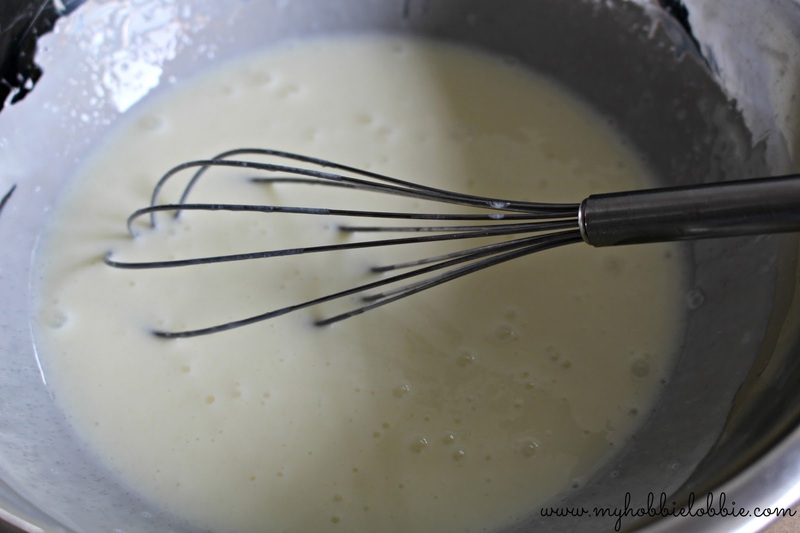 In a large mixing bowl, whisk together the yogurt and sugar. Now add the semolina, milk and baking powder and mix thoroughly. Next, stir in the melted butter and whisk well. Let the batter rest for a while (about 5-10 minutes or so) for the semolina to absorb some of the moisture. 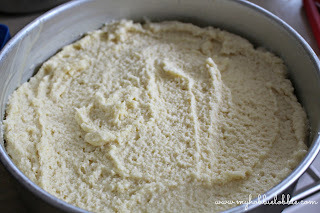 Pour the batter into the greased cake tin and bake for about 40-45 minutes. While the cake is baking, make the sugar syrup. Place the sugar water and cinnamon in a saucepan. 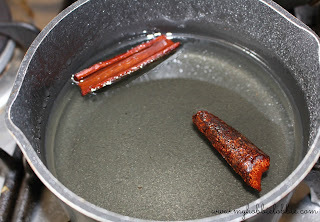 Bring to a boil on high heat stirring occasionally, but only till the sugar dissolves. Turn the heat down to low and continue to cook for a few minutes till the syrup thickens. Then take off the heat and stir in the lemon juice. Set aside to cool and then remove the cinnamon. 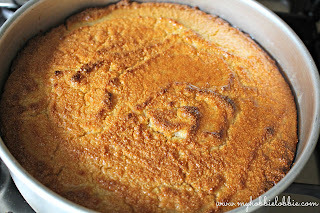 When the cake is ready, take it out of the oven and immediately pour the cool syrup on the hot cake. Leave the cake to cool off completely and let the cake absorb the syrup, at least for an hour. 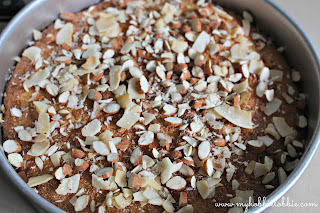 Just before serving, top the cake with the almond and coconut chips.